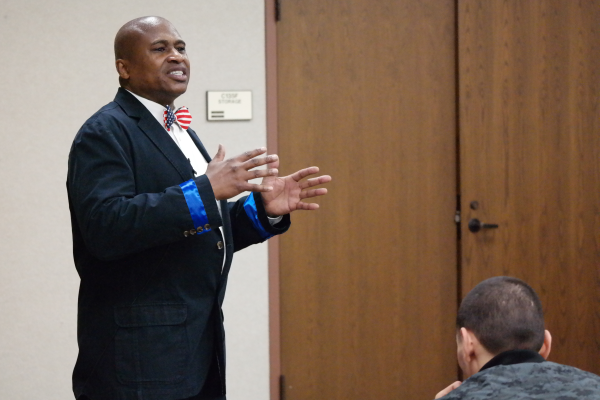 Political science professor Dr. Stacey Jurhree during a Black History Month event. Et Cetera File Photo. Government professor Stacey Jurhree and history professor Mike Noble have unexpectedly stepped down from their positions as Faculty Association president and vice president following a dispute at a Nov. 16 association meeting. Noble, who is in his ninth year at Eastfield, and Jurhree, in his 25th year, resigned Nov. 16 and Nov. 18, respectively, in what some faculty members say was an unprecedented event. According to fall 2018 enrollment records, 48.3 percent of Eastfield students are Hispanic, 20.8 percent are Caucasian, 19.2 percent are African-American, 4.4 percent are Asian and 7.3 percent identify as other. Multiple faculty members, all of whom asked to remain unnamed, said that the Nov. 16 meeting began as any other would, with members discussing current events and upcoming proposals relating to campus. Then the topic of the email was brought up. Noble, who was sitting in the front of the room, stepped in, openly deeming it racially offensive. Email sent out by Government Professor Stacey Juhree on Nov. 15. Exchanges about the email ensued with multiple faculty members criticizing Jurhree, and some Faculty Association officers attempting to explain what Jurhree meant in his email. Noble suddenly left the meeting as multiple faculty members continued to press Jurhree on the issue. Noble resigned from his vice president position through email later that day. Jurhree officially stepped down Nov. 18, stating in an email that he wanted to focus on his teaching. When asked about whether the pushback over the email was behind his resignation, Jurhree said no. He also said that the contents of his email were misunderstood, claiming that he was expressing his frustration about the college’s treatment of minority students. “I was asking, ‘Why now that we have more brown and black students, do we feel the need to have to entertain them?’ ” he said. Various faculty members stated that this isn’t the first time Jurhree has sent controversial emails. A March 2007 issue of The Et Cetera reported that Jurhree was placed on paid administrative leave after sending an email criticizing administration, Dallas County Community College District leaders and members of the Faculty Association. The email was sent to the entire Eastfield mailing list, as well as then-DCCCD Chancellor Wright Lassiter. His absence from class led to a student-led rally over concerns for the professor’s return and their grades. Jurhree returned to campus several days later. In regards to Jurhree and Noble’s stepping down, Eastfield College Vice President Mike Walker said in an email that leadership changes within the Faculty Association were independent of administration. “I can say that while our faculty may have disagreements about issues they deal with, I am certain that they are fully invested in, and fully committed to, excellent teaching and students’ success,” he said. Walker also said that administration wants to completely understand the situation before making a further comment.